About one-in-four Americans (23%) say there has been a time when they took leave from work to care for a family member with a serious health condition. An additional one-in-four say that if this hasn’t happened to them already, it’s at least somewhat likely that it will in the future. The current debate over paid leave often focuses on maternity and paternity leave. Yet among adults who were employed in the past two years, more took time off from work to care for a sick family member (11%) than did so following the birth or adoption of a child (7%), according to a new Pew Research Center study. Roughly two-thirds of all adults (67%) say workers should receive paid leave when they need to take time off to care for a sick family member, and most (60%) of those who took family leave in the past two years say they did receive at least partial pay while they were out of work. But the vast majority of those who received at least partial pay (86%) say some of that pay came from vacation, sick leave or personal time off. Relatively few of these workers (15%) say they received pay from a family and medical leave benefit provided by their employer. Workers who took maternity or paternity leave with at least some pay in the past two years are significantly more likely to report that they were paid, at least in part, through an employer-provided family or medical leave policy (28%). Family-leave takers are generally more satisfied with the amount of time they took off from work than parental-leave takers – half of those who took leave from work to care for a sick family member say they took about as much time off as they needed or wanted to, compared with 36% of those who took maternity or paternity leave. Even so, four-in-ten family-leave takers say they took less time off than they needed or wanted to. And among those who say they took too little time off, family-leave takers are much more likely than parental-leave takers to say they came back to work sooner than they needed or wanted to because they were worried about job security. For example, 62% of family-leave takers who came back to work earlier than they would have liked say they thought they might risk losing their job if they took more time off. Only 37% of maternity- and paternity-leave takers say the same. In addition, among those who returned to work sooner than they wanted to, family-leave takers were more likely than those who took parental leave to say they worried about the impact their time away was having on their co-workers. About half of family-leave takers who took less leave than they would have liked (46%) say they felt badly about their co-workers taking on additional work in their absence, compared with 31% those returning from maternity or paternity leave. There are some intriguing gender dynamics underlying family caregiving patterns. A narrow majority of all Americans (54%) say that when a family member has a serious health condition, caregiving responsibilities fall equally on men and women, but nearly as many (45%) say these responsibilities fall mainly on women. Most women (59%) say that family caregiving responsibilities fall mainly on women, while only 29% of men agree with this assessment. A majority of men (69%) say family caregiving responsibilities fall equally on men and women. However, women and men who were employed in the past two years are equally likely to say that they have taken time off to care for a sick family member during that time, but women report having taken slightly more time off, on average, than men. And women are much more likely than men to say that they were the primary caregiver for their sick family member. 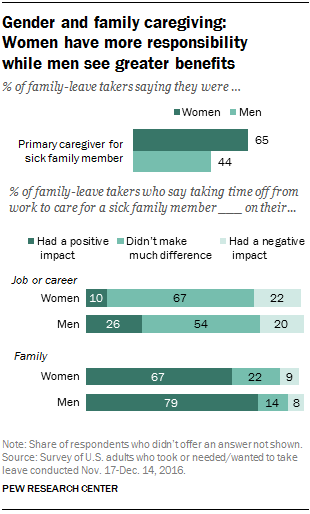 Roughly two-thirds (65%) of female family-leave takers say they provided more care for their sick family member than anyone else in the family. Only 44% of male family-leave takers say they were the main caregiver. For women who have taken family leave in the past two years, a plurality (38%) say they were caring for a sick parent. Fewer say they were caring for a spouse or partner (25%) or caring for a child younger than 18 (20%). Men who took family leave in the past two years are just as likely to say they were caring for a spouse or partner (33%) as they are to say they were caring for a parent (34%). Some 13% of men say they took time off from work to care for a sick child. Among all workers who have taken time off from work in the past two years to care for a sick family member, about six-in-ten say the experience did not have much of an impact on their career. For those who do think it made a difference, men are more than twice as likely as women to say the impact on their career was positive (26% vs. 10%). Men are also more likely than women to say their family benefitted from their taking time off from work: 79% of men, compared with 67% of women, say taking time away from work to care for a sick family member had a positive impact on their family.